Sold to new owners Keith and Janet Bredehoeft in January 2008, the newly renovated Higginsville Lanes has reignited bowling in the Higginsville area. 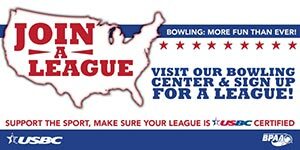 With the addition of the "LaneSide Grill", a full service pro shop and updates to the bowling area wtih synthetic lanes and much more, Higginsville Lanes has reestablished itself as a family oriented bowling center. They currently have nine leagues, with one being a senior league and two devoted to the youth. Open bowling is available on the weekends. Birthday parties, Corporate and private bookings are growing in popularity. tournament participation is also growing in interest. Bowling remains one of the fastest growing sports. It is a sport that you can do at an early age and enjoy for a lifetime. As with any business, the appreciation should go to the staff,General Manager; Adam Crowley, Pro shop manager: Jerry Graham, and employees: Harold Griffel, Katie Travis, Devin Oswalt, Aimee Travis and Aaron Chapman. 2017 Husker Bowling Team, Zone Champs! Back row Trevor Disberger taking stats. The Husker Bowling Club had their first practice meet at Concordia Lanes, Sunday February 23. The format was a 5 member team event, bowling “BAKER” style, with each bowler bowling only 2 frames per game. The huskers bowled 10 games with 1357 pins. “This was our first experience in this type of team play, so it was a learning experience. It was a lot of fun.” Janet Bredehoeft, USBC registered Volunteer. 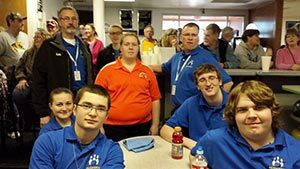 It’s not too late to get involved; the team will travel to centers around the area and have a zone competition again at Concordia bowl, on March 23rd. the winner of that gets to go to state in Union MO in April. The club was just recently formed and is open to all Laf Co C-1 high school students. The cost is very minimal and will not interfere with other team sports. Higginsville Lanes had donated practice time, coaching and pro shop services for the team. Some equipment has been donated and cash donations are being accepted to help off set the cost of entry fees and team shirts. 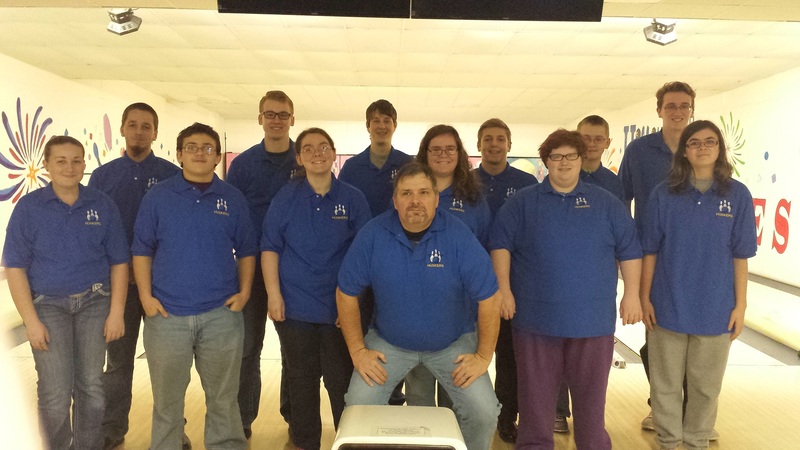 The team practices every Sat morning at 11am at Higginsville lanes. The winners of the drawing for the best costumes were Mike & Jessica Crabtree. They were dressed as characters from “Beetlejuice”. Dan and Trevor Disberger competed in the National finals of the International Family Tournament held July 24-27th in Columbus Ohio. 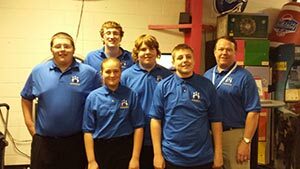 They qualified at Higginsville Lanes then they advanced to Zone and after that, they placed in the top 2 in the state of Mo. At nationals they competed in 6 games of qualifying with the top 8 advancing to match play. They were seeded 6th. After match play they ended up 7th overall. The BPAA (Bowling Proprietors Association of America) awarded $70000.00 in scholarships at Nationals. Some highlights of the trip were watching the final match play bowled for the mens and womens US Open, meeting some of the professionals bowlers and getting their autographs. “This was a trip of a life time for us “ said Dan. October 7th 2012 Higginsville Lanes Youth Bowlers competed in the KCO youth scholarship tournament at Lunar Bowl. 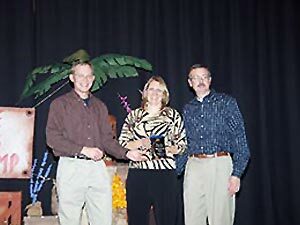 Higginsville Lanes receive 2010 Business of The Year!